Five submarine communication cables cross the Scottish shore at Scad Head on Hoy, Orkney. A submarine communications cable is a cable laid beneath the sea to provide telecommunication links between countries. The first such cables carried telegraphy traffic. Subsequent generations of cables carried telephone traffic, then data communications traffic. All modern cables use fiber optic technology to carry digital payloads, which include telephone traffic, internet signals, and private data traffic. As of 2005, submarine cables link all the world's continents except Antarctica. 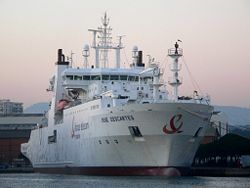 Submarine cables are laid using special cable-laying ships, such as the modern René Descartes, operated by France Telecom Marine. After William Cooke and Charles Wheatstone had introduced their working telegraph in 1839, the idea of a submarine line across the Atlantic Ocean began to be thought of as a possible triumph of the future. Samuel Morse proclaimed his faith in it as early as the year 1840, and in 1842 he submerged a wire, insulated with tarred hemp and India rubber, in the water of New York harbor, and telegraphed through it. The following autumn, Wheatstone performed a similar experiment in Swansea bay. A good insulator to cover the wire and prevent the electric current from leaking into the water was necessary for the success of a long submarine line. India rubber had been tried by Moritz von Jacobi, the Russian electrician, as far back as 1811. Another insulating gum that could be melted by heat and readily applied to wire made its appearance in 1842. Gutta-percha, the adhesive juice of the Palaquium gutta tree, was introduced to Europe by William Montgomerie, a Scottish surgeon in the service of the British East India Company. Twenty years earlier, he had seen whips made of it in Singapore, and he believed that it would be useful in the fabrication of a surgical apparatus. Michael Faraday and Wheatstone soon discovered the merits of gutta-percha as an insulator, and in 1845, the latter suggested that it should be employed to cover the wire which was proposed to be laid from Dover to Calais. It was tried on a wire laid across the Rhine between Deutz and Cologne. In 1849, C.V. Walker, electrician to the South Eastern Railway, submerged a wire coated with it, or, as it is technically called, a gutta-percha core, along the coast off Dover. The first transatlantic telegraph cable crossed the Atlantic Ocean from Foilhommerum, Valentia Island, in western Ireland to Heart's Content, in eastern Newfoundland. The transatlantic cable bridged North America and Europe, and expedited communication between the two. Whereas it would normally take at least ten days to deliver a message by ship, it now took a matter of minutes by telegraph. Five attempts were made over a nine year period—in 1857, two in 1858, 1865, and 1866—before lasting connections were finally achieved by the SS ''Great Eastern'' with the 1866 cable and the repaired 1865 cable. Additional cables were laid between Foilhommerum and Heart's Content in 1873, 1874, 1880, and 1894. By the end of the nineteenth century, British, French, German, and American-owned cables linked Europe and North America in a sophisticated web of telegraphic communications. Cyrus Field was the force behind the first transatlantic telegraph cable, attempted unsuccessfully in 1857 and completed on August 5, 1858. Although not considered particularly successful or long-lasting, it was the first transatlantic cable project to yield practical results. The first official telegram to pass between two continents was a letter of congratulation from Queen Victoria of the United Kingdom to the President of the United States James Buchanan on August 16. The cable was destroyed the following month when Wildman Whitehouse applied excessive voltage to the cable while trying to achieve faster telegraph operation. The short period of use undermined public and investor confidence in the project, and delayed efforts to restore a connection. Another attempt was undertaken in 1865, with much-improved material and, following some setbacks, a connection was completed and put into service on July 28, 1866. This time the connection was more durable, and even more public confidence resulted when the 1865 cable was repaired and put into service shortly afterwards. An 1863 cable to Bombay provided a crucial link to the Saudi peninsula. In 1870, Bombay was linked to London via submarine cable in a combined operation by four cable companies, at the behest of the British Government. In 1872, these four companies were combined to form the mammoth, globe-spanning Eastern Telegraph Company, owned by John Pender. A spin-off from Eastern Telegraph Company was a second sister company, the Eastern Extension, China and Australasia Telegraph Company, commonly known simply as "the Extension." This was completed in 1902–03, linking the U.S. mainland to Hawaii in 1902, and Guam to the Philippines in 1903. Canada, Australia, New Zealand, and Fiji were also linked in 1902. 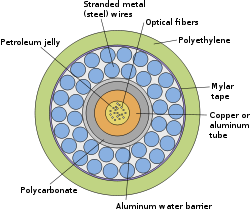 The many layers in a submarine communications cable are revealed by its cross section. Transatlantic cables of the nineteenth century consisted of an outer layer of iron and later steel wire, wrapping India rubber, wrapping gutta-percha, which surrounded a multi-stranded copper wire at the core. The portions closest to each shore landing had additional protective armor wires. Gutta-percha, a natural polymer similar to rubber, had nearly ideal properties for insulating submarine cables, aside from a rather high dielectric constant, which made cable capacitance high. Gutta-percha was not replaced as a cable insulation until polyethylene was introduced in the 1930s. Gutta-percha was so critical to communications that in the 1920s, the American military experimented with rubber-insulated cables, since American interests controlled significant supplies of rubber, but no gutta-percha manufacturers. Early long-distance submarine telegraph cables exhibited formidable electrical problems. Unlike modern cables, the technology of the nineteenth century did not allow for in-line repeater amplifiers in the cable. Large voltages were used to attempt to overcome the electrical resistance of their tremendous length. Nonetheless, the data rate for telegraph operation was severely limited. In modern terms, the cables had very limited bandwidth. As early as 1823, Francis Ronalds had observed that electric signals were retarded in passing through an insulated wire or core laid underground, and the same effect was noticeable on cores immersed in water, particularly on the lengthy cable between England and The Hague. Michael Faraday showed that the effect was caused by capacitance between the wire and the earth (or water) surrounding it. Faraday had noted that when a wire is charged from a battery (for example by pressing a telegraph key), the electric charge in the wire induces an opposite charge in the water, as it travels along. As the two charges attract each other, the exciting charge is retarded. The core acts as a capacitor distributed along the length of the cable that, coupled with the resistance and inductance of the cable, limits the speed at which a signal travels through the conductor of the cable. Early cable designs failed to analyze these effects correctly. Famously, E.O.W. Whitehouse had dismissed the problems and insisted that a transatlantic cable was feasible. When he subsequently became electrician of the Atlantic Telegraph Company, he became involved in a public dispute with William Thomson. Whitehouse believed that, with enough voltage, any cable could be driven. Because of the excessive voltages recommended by Whitehouse, Cyrus Field's first transatlantic cable never worked reliably, and eventually short circuited to the ocean when Whitehouse increased the voltage beyond the cable design limit. Thomson designed a complex electric-field generator that minimized current by resonating the cable and a sensitive light-beam mirror galvanometer for detecting the faint telegraph signals. Thomson became wealthy from the royalties of these and several related inventions. Thomson was elevated to Lord Kelvin for his contributions in this area—chiefly a reliable mathematical model that permitted design of the equipment for accurate telegraphy. The effects of atmospheric electricity and the geomagnetic field on submarine cables also motivated many of the early polar expeditions. Thomson had produced a mathematical analysis of propagation of electrical signals into telegraph cables based on their capacitance and resistance, but since long submarine cables operated at slow rates, he did not include the effects of inductance. By the 1890s, Oliver Heaviside had produced the modern general form of the telegrapher's equations, which included the effects of inductance and were essential to extending the theory of transmission lines to the higher frequencies needed for high-speed data and voice. While laying a transatlantic telephone cable was seriously considered from the 1920s, a number of technological advances were required for cost-efficient telecommunications that did not arrive until the 1940s. In 1942, Siemens Brothers, in conjunction with the United Kingdom National Physical Laboratory, adapted submarine communications cable technology to create the world's first submarine oil pipeline in Operation Pluto during World War II. TAT-1 (Transatlantic No. 1) was the first transatlantic telephone cable system. Between 1955 and 1956, cable was laid between Gallanach Bay, near Oban, Scotland, and Clarenville, Newfoundland and Labrador. It was inaugurated on September 25, 1956, initially carrying 36 telephone channels. In the 1960s, transoceanic cables were waveguides transmitting frequency-multiplexed radio signals. The repeaters were the most reliable vacuum tube amplifiers ever designed. A high voltage direct current wire powered the repeaters. Many of these cables still exist and are usable, but abandoned because their capacity is too small to be commercially viable. Some have been used as scientific instruments to measure earthquake waves and other geomagnetic events. Diagram of an optical submarine cable repeater. In the 1980s, fiber optic cables were developed. The first transatlantic telephone cable to use optical fiber was TAT-8, which went into operation in 1988. Modern optical fiber repeaters use a solid-state optical amplifier, usually an Erbium-doped fiber amplifier. Each repeater contains separate equipment for each fiber. These comprise signal reforming, error measurement and controls. A solid-state laser dispatches the signal into the next length of fiber. The solid-state laser excites a short length of doped fiber that itself acts as a laser amplifier. As the light passes through the fiber, it is amplified. This system also permits wavelength-division multiplexing, which dramatically increases the capacity of the fiber. Repeaters are powered by a constant direct current passed down the conductor near the center of the cable, so all repeaters in a cable are in series. Power feed equipment is installed at the terminal stations, The power feed current is returned through what is called a sea earth. The optic fiber used in undersea cables is chosen for its exceptional clarity, permitting runs of more than 100 kilometers (km) between repeaters to minimize the number of amplifiers and the distortion they cause. Originally, submarine cables were simple point-to-point connections. With the development of submarine branching units (SBUs), more than one destination could be served by a single cable system. Modern cable systems now usually have their fibers arranged in a self-healing ring to increase their redundancy, with the submarine sections following different paths on the ocean floor. One driver for this development was that the capacity of cable systems had become so large that it was not possible to completely back-up a cable system with satellite capacity, so it became necessary to provide sufficient terrestrial back-up capability. Not all telecommunications organizations wish to take advantage of this capability, so modern cable systems may have dual landing points in some countries (where back-up capability is required) and only single landing points in other countries where back-up capability is either not required, the capacity to the country is small enough to be backed up by other means, or having back-up is regarded as too expensive. A further redundant-path development over and above the self-healing rings approach is the "Mesh Network" whereby fast switching equipment is used to transfer services between network paths with little to no effect on higher-level protocols if a path becomes inoperable. As more paths become available to use between two points, the less likely it is that one or two simultaneous failures will prevent end-to-end service. Cables can be broken by fishing trawlers, anchoring, undersea avalanches, and even shark bites. Breaks were common in the early cable-laying era due to the use of simple materials and the laying of cables directly on the the ocean floor rather than burying the cables in trenches in vulnerable areas. Cables were also sometimes cut by enemy forces in wartime. The Newfoundland earthquake of 1929 broke a series of trans-Atlantic cables by triggering a massive undersea avalanche. The sequence of breaks helped scientists chart the progress of the avalanche. The 2006 Hengchun earthquake on December 26, 2006, rendered numerous cables near Taiwan inoperable. To effect repairs on deep cables, the damaged portion is brought to the surface using a grapple. Deep cables must be cut at the seabed and each end separately brought to the surface, whereupon a new section is spliced in. The repaired cable is longer than the original, so the excess is deliberately laid in a "U" shape on the sea-bed. A submersible can be used to repair cables that are close to the surface. A number of ports near important cable routes became homes to specialized cable repair ships. Halifax, Nova Scotia, was home to a half dozen such vessels for most of the twentieth century, including long-lived vessels such as the CS Cyrus Field, CS Minia, and CS Mackay-Bennett. The latter two were contracted to recover victims from the sinking of the RMS ''Titanic''. The crews of these vessels developed many new techniques to repair and improve cable laying, such as the "plough," a device to bury cables. ↑ Brainy History, Events. Retrieved July 6, 2007. ↑ Canadian Government, Canada-Australia relations history. Retrieved July 6, 2007. Glover, Bill. Timeline of Submarine Communications Cables, 1850-2016. History of the Atlantic Cable & Submarine Telegraphy. Burns, Bill. History of the Atlantic Cable & Submarine Telegraphy - Wire Rope and the Submarine Cable Industry. History of the Atlantic Cable & Submarine Telegraphy. The International Cable Protection Committee. Comprehensive list of the approximately 1000 cable landing sites globally. Kidorf Innovative Methods - Landings of the World's Submarine Systems. List of the suppliers of the world's undersea communications cables. Kidorf Innovative Methods - Suppliers of the World's Submarine Systems. Thomas, Lynsey. Submarine Cables in 2006. Submarine Cables in 2006. History of "Submarine communications cable"
This page was last modified on 24 October 2015, at 14:32.